PRESIDENT Emmerson Mnangagwa's motorcade was on Friday allegedly blocked by a long-winding fuel queue at Westgate roundabout in Harare West. 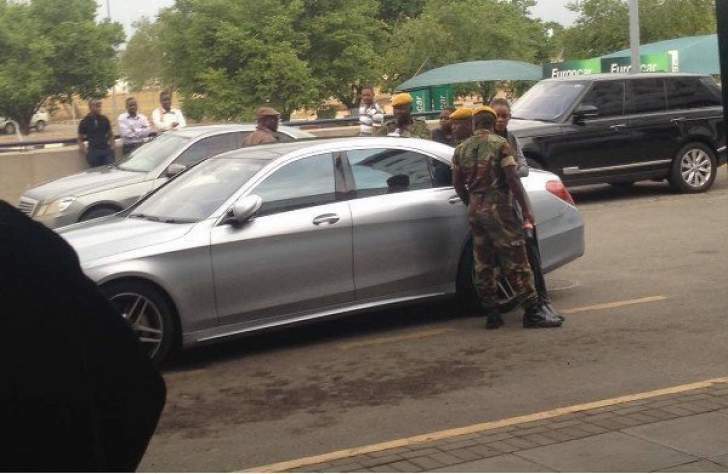 Mnangagwa is said to have been on his way to attend the Addrotech machinery showcase at Gwebi College. The motorists reportedly refused to move off the way and Mnangagwa was forced to abandon the journey. The country has been experiencing acute fuel shortages over the past three months. Long snaking queues have become the order of the day. The government seems to be at sixes and sevens in dealing with the crisis as it not able to diagnose the cause of the crisis. Shortage of foreign currency, hoarding of fuel, consumption of fuel by small luxury cars, and social media have all been blamed by the officials for causing the fuel crisis. Commuter omnibuses, private motorists and long distance buses are spending endless and often fruitless hours queuing for petrol at the country's dry filling stations. Zimbabwe has, for a long time now, been struggling to pay its foreign suppliers of fuel and other commodities – due to its dire finances which economists say has been worsened by corruption and mismanagement. The president of the Passengers Association of Zimbabwe (Paz), Tafadzwa Goliati, told the Daily News yesterday that the ongoing transport blues in the country were a manifestation of "a national crisis". "Passengers are suffering because commuter operators use their own discretion to hike fares, and the government has been quiet. "Passengers are now boarding transport that is not recommended, trying to save as much money as possible. "Passengers are even boarding the top deck of buses, paying $1, while others are faced with the crisis of using $6 for a single trip to and from work," Goliati said. This comes as both commuter omnibus and long distance bus operators have sharply increased their fares, citing the fuel shortages and the rising prices of spare parts which they now pay for in US dollars. In the meantime, the demand for fuel has also increased following the return from the festive season by most people, as well the opening of schools. As a result, most commuters are now paying as high as $8 for trips that normally cost $1, while long distance bus operators are charging anything up to $60 on routes that once attracted a high fare of $25 before the fuel crisis kicked in. In the capital city, the representative of the Greater Harare Association of Commuter Operators (Ghaco), Ngoni Katsvairo, said until the fuel shortages were resolved, the current transport crisis would continue. "All this is because the fuel situation has remained the same. We wait for hours in fuel queues and use a full tank just for about one to two days, and then we return again to the fuel queue. "In terms of price hikes … perhaps this is because of cartels, especially those who operate mushika-shika, but at the ranks fares should still be the same," Katsvairo said. According to the government, Zimbabwe now requires on average US$100 million per month to cater for its fuel imports. However, the acute shortages of foreign currency in the country have seen the worsening of long and winding fuel queues which Zimbabweans had hoped would now be a thing of the past. The country is currently in the grip of a huge economic crisis which has also resulted in shortages of basic consumer goods and medicines. Apart from shortages, the government is also struggling to end the doctors' strike and to avoid further industrial actions by the rest of the civil service, which is pressing for salaries to be paid in US dollars.